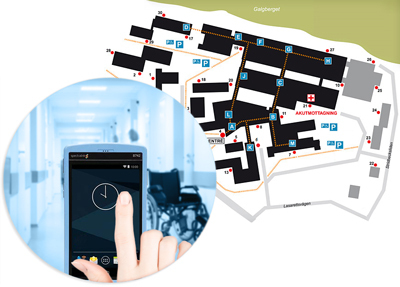 The Hospital in Halmstad, Sweden, was recently in need of a new mobile solution for alarm management. COBS offered the opportunity to try out the WiFi handset PIVOT:s, which met the requirements and is now successfully installed at the Hospital. PIVOT:S is developed for tough environments with high demands on reliability. The IP-64 classification and a protective glass makes it extra durable and unlike most smartphones it can last for several years. The Android based platform makes it easy to use and offers access to several apps. PIVOT:S is a WiFi handset, easy to integrate to other systems within the Hospital alarm and communication solution. Providing safe and professional care is basic within all Healthcare businesses. Alarm management is crucial, and devices with high security and reliability is demanded. The hospital in Halmstad systematically works with patient safety and has systems and routines to minimize the risk of injuries. ”In Halmstad, they have chosen to use the PIVOT:S only as a mobile device for alarm management. However, it is of course also possible to use it to make calls, send messages or e-mail”, says Claes Falk at COBS AB.